Structure - Our driving instuctor training course is designed in such a way that you will be able to fit it in with your other commitments. The training will take place in the car. You will have full access to our Tri-Coaching Instructor Training Online Package, which contains links that take you to webinars that detail what you need to do to prepare for your in-car sessions. These webinars contain a wealth of information about the 'bigger picture' of being a driving instructor, such as, the Goals for Driver Education, learning theories and models of behavioural change, coaching and client-centred learning techniques and the DVSA National Standards. You will be able to track and monitor your progress through the in-car sessions with action plans and marking sheets in the (TCIT) driving instuctor training course book, as well as being available for download from this website. We will advise you and work with you to take the three parts of the qualifying examination but ultimately the timing of when you go for these is down to you and how ready you feel. The course will take around six months to complete if you attend one in-car session every two weeks. 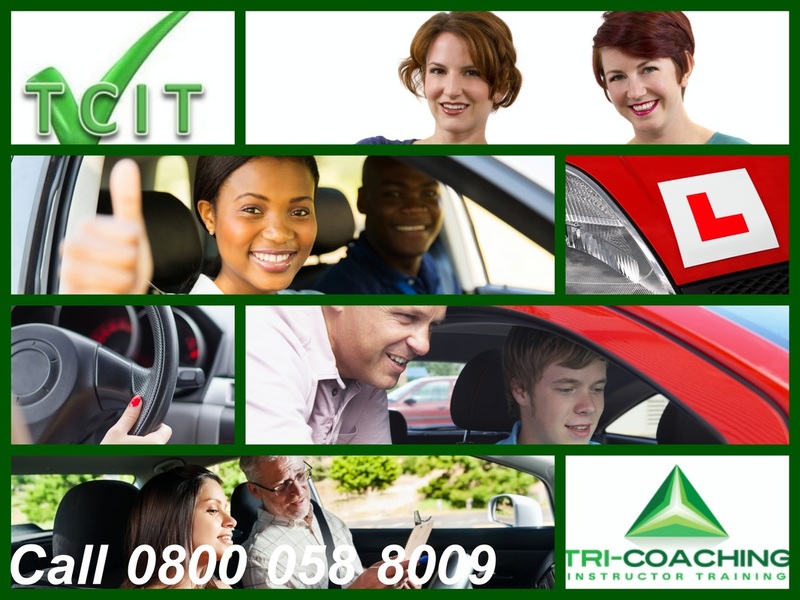 Content - The content of the course has been developed so that you will understand what is involved in becoming a good driving instructor. This insight will then enable you to go and complete the three parts to the qualifying examination. The course focuses on the National Standards from the DVSA and, in particular, the DVSA National Driver and Rider Training Standard, which sets out the competences you will need to demonstrate in order to be a driving instructor. In the same way as you will be placing a far greater emphasis on safe driving for life than getting through a driving test when teaching your pupils to drive, we will be focused on developing your skills as a driving instructor rather than teaching you to pass a test. The Part 3 test of instructional ability is notoriously difficult but often this is because all the focus of the training has been narrowly targeted at the ADI Part 3 pre-set test combinations. We focus on a whole breadth and range of skills and techniques and develop your understanding of when to use and apply them, so that when you go for your ADI part 3 test it is like sitting in an interview and showing off your skills. There are thirteen modules in the TCIT product. Twelve modules prepare you to become a driving instructor and Module 13 focuses on preparing you to pass the Part 3 test. Before attending each In-Car Session in each module you will need to work through the relevant preparation video, which you will receive through the online part of the course. During the In-Car Sessions you will be working with Action Plans and Marking Sheets, completing exercises and referring to the DVSA National Standards. 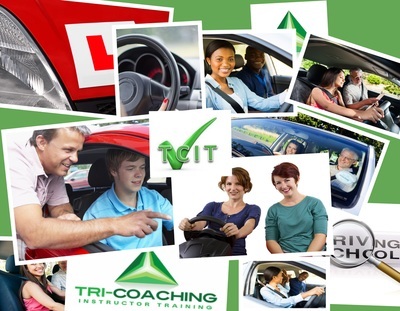 In-car sessions will develop your understanding of how to adapt the way you teach to suit the ability and needs of the learner driver by looking at Beginner, Partly Trained, Trained pupils and Full Licence Holders (FLH). Having a high level of subject knowledge is important so modules will focus on the various teaching topics you need to be able to deliver. This will also help develop your understanding of how to make the best use of your practice areas. Price: £600 (including VAT) plus agreed rate 'pay as you go' with the Trainer. If you wish to take on a Trainee Licence you will need to complete 40 hours of training around specific areas. The Course covers this. On Trainee Licence, you need to cover a further 20 hours of supervision, training and development. Module 13 of the Course covers this. The Record of Progress at the front of the Course Book contains a Progress Details form, which will keep a record of the sessions you have completed. Your Trainer will be able to refer to this when completing your declaration to the DVSA for your Trainee Licence. Tri-Coaching Instructor Training (TCIT) Part 3 focuses on getting you, the trainee driving instructor, ready to take your Part 3 test. The course assumes you have already passed your Part 1 and Part 2. The course consists of two modules. Module One is eight x five-hour sessions (these can be split into 16 x 2.5 hour sessions over four months at one a week; or completed intensively over a two-week period; or any variation of this to suit you and your trainer). Module Two consists of 5 x four-hour sessions divided between lesson observation; and training and development. The course has been designed to satisfy the requirements of the DVSA PDI Trainee Licence although it is not necessary for you to go on Trainee Licence in order to complete the course. The course will still help you prepare for your Part 3. Each in-car session is self-contained. It will not be necessary for you to complete any preparation or homework either side of the in-car session. This is because you may be completing this course on an intensive basis – four days a week over two weeks. However, if you have time between sessions, please spend it reading up on what is needed to be a driving instructor, practising your driving, commentary driving and ability to watch the pupil (by observing the driver when you are a passenger). and completing action plans so that you have a record of your progress and will know what to focus on during Module 2 and prior to taking your Part 3. Use the notes pages to write down learning points you have covered with the Trainer during the session. There are eight x five-hour sessions in Module One, which can be completed over a two-week period of four days a week. In this way, you will be completing the 40-hour requirement if you wish to go on a Trainee Licence and your Trainer will be able to sign off the ADI 21T (the regulation form the DVSA needs to see to confirm the completion of the 40-hours requirement). Thereafter, you and your Trainer should be working through Module Two, which consists of five x four-hour sessions to cover the Additional Training requirement of 20 hours whilst on Trainee Licence so that your Trainer will be able to sign off the ADI 21AT. TCIT Part 3 also includes Route 51. Route 51 – How to pass your Part 3 consists of a course book, divided into six sections and including plenty of opportunity for you to reflect and self-evaluate your performance, helping you to identify your strengths and development needs. There are online materials included in the course, which will be delivered to your email address in the form of emails. The emails will contain links, which will take you to pre-recorded webinars that complement the course book. You are advised to save the emails in a folder so that you can access them easily and re-visit the webinars by following the links whenever you wish. The webinars are not downloadable so you will need to follow the links each time you want to view. Price: £300 (including VAT) plus agreed rate 'pay as you go' with the Trainer.